This toothy thing thinks we are its next meal so i'll send Dennis in first to make friends with it, then we can all go for go for a swim. MARCH 2004 to somewhere near 2005. Quite a sturdy brute around 7metres long 2.4metres wide & 3.5metres high, will sleep up to 5 unless two kip in the front then we can get seven in.But breakfast would have to wait until the tables put back up. Last time I came to Australia, one of these fella's kept me awake then made a laughing sound, by the way this one is real. 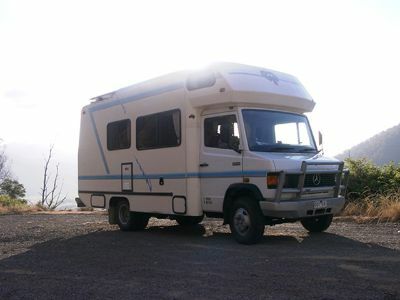 OUR NEW MERCEDES MOTORHOME ITS BIG WHICH GIVES LOADS OF SPACE. MELBOURNE a city with charm and hidden secrets like the GRAN PRIX CIRCUIT, THE EXIBITION CENTRE, ALONG WITH ITS CASINO, AND VERY HIGH SKYSCRAPERS to name a few . It was loverly to have somewhere to stop until we could sort ourselves out, and the residents Melvie and Geoff were more than helpful, which is very much appreciated. THANK YOU. BEFORE SETTING OFF ANYWHERE WE NEEDED TO PUT AS MANY HEADS TOGETHER, TO THINK,PLAN, AND THEN IGNORE, SO THAT THE ADVENTURE WOULD BE A SURPRISE TO US, AS IT IS TO YOU. WE ARE NOW ARMED AND KITTED OUT FOR OUR TRAVELS, FIRST WE WILL TRY OUT TASMANIA, BEFORE SETTING OUT TO BACK AND BEYOND OF WHO KNOWS WHERE. KEEP YOUR EYES PEELED ON THIS SITE. YOU NEVER KNOW WHAT WE MIGHT COME ACROSS. Out in the bush this KOALA was enjoying his meal of eucalyptus leaves his favorite snack. We came across this very friendly KOOKABURRA, who became very tame when offered sardine part of my fishing bate, which he fed from off my hand. Hidden amongst the undergrowth was this LYREBIRD,who performes a spectacular dance during courtship. His tail forms an opened umbrellow of colour with tail feathers that entrance his mate.This bird is a great immitator and can copy most birds within the scrub. PELICANS are quite at home with their neighbours the CORMERANTS and various ducks, there seems to be plenty of fish to go around. This marvelous creature is called a QUOLL CAT, who was taken by surprise as I sneaked up and took this photo of him, before it scuttled back into the undergrowth. These strange looking birds with their long beaks are IBIS, and are great scavengers for particles of food left at a near food outlet. Wednesday 24th. March stopped for a short time at PHILLIP ISLAND, then after touring around, we stopped overnight at WONTHAGGI a historical mining town.We then moved on to PORT ALBERT,& continued to YARRAM before travelling to SALE where we saw this field full of White Cockatoo's, and STRATFORD - ON - AVON. We then were heading for BAIRNSDALE when our motorhome came to a halt with loss of power, we suspected a fuel blockage as it was dark we limped onto a garage forcourt and stopped the night. Having set off with a full tank of diesel we only did about two km. when the engine cut out again, having cleaned all the diesal line filters we had cured the problem, and set off and toured BAIRNSDALE quite a big town centre. THIS BLACK SWANN WAS UPSIDE DOWN SEARCHING FOR HIS DINNER AMONGST THE SEA BED. 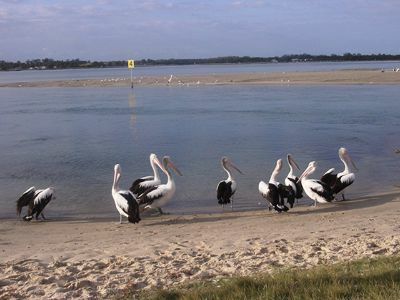 We stopped at LAKES ENTRANCE where we found a lovely beach shared with Black Swanns, and Pelicans. UNFORTUNATELY THE LAKES ENTRANCE SEA, ALSO CONTAINED CREATURES THAT I DIDN'T FANCY SWIMMING WITH LIKE THIS GIANT JELLYFISH WHICH WAS ABOUT 12 INCHES ACROSS. Friday 26th. March after a relaxing sunbathing day at LAKES ENTRANCE we moved onto ORBOST where we stopped overnight. Saturday 27th.March stopped shortly at CANN RIVER with beautiful blue lakes leading to a white sandy beach to the sea. Looking out to sea at CANN RIVER before moving onto MALLACOOTA another short stop to get a bit of sunbathing. On our way to GENORA we came across this big fella, he's a WOMBAT a notinal animal that burrows underground.We were very lucky to see this one at the side of the road, it was about 24 inches from its nose to its tail, we didn't disturb it long, we let it go on its way. We stayed the night at WALLAGARAUGH. Sunday 28th March we had a lie in due to the clocks going back in NEW SOUTH WALES, where in ENGLAND the clocks moved forward.So at 09-00am. here it was midnight in ENGLAND. We stayed at the harbour then moved onto a beach all day at EDEN, before stopping the night at MERIMBULA. Monday 29th. March through to Wednesday 31st. March stopped at a number of old Aborigine places, through TUTHUA to BERMAGUI where we stopped the night after paddling and sunbathing all day. Thursday 1st.April moved onto BATEMANS BAY plenty of shops, then onto PEBBLE BEACH where we made new friends. I THINK THIS YOUNG THING WAS LOOKING FOR HIS MUM. WE GOT VERY EXCITED WHEN WE FIRST SAW A KOOKABURRA HERE THEY CAME IN FORCE I THINK THEY WANTED FOOD. THEY WERE NOT THE ONLY ONE'S THESE PARROTS WERE ALSO FEELING PECKISH. FRIDAY 2ND. APRIL we moved to KIAMA, below WOLLONGONG, where we stopped on a camp site, to catch up on the washing (clothes that is) and to recharge the batteries. Saturday 3rd.April Still at KIAMA, we saw two blow holes where water was pushed high into the air by the tide through an opening in the rock caused by years of corrosion.We then moved to SHELL HARBOUR, where we stopped the night. Sunday 4th and Monday 5th April we had a terrific storm with thunder and lightning whilst we were at WOLLONGONG, which kept us awake for most of the night. We then moved to FIGTREE where the weather seemed a little calmer,so we stopped over. TUESDAY 6TH.APRIL TO THURSDAY 8TH APRIL MOVED AND STAYED IN SYDNEY. SYDNEY OPERA HOUSE SHINES AT NIGHT ESPECIALLY WITH A FULL MOON. SYDNEY BRIDGE IS A SPECTACULAR SITE YOU CAN PAY AROUND $150 - $220 ( £60 - £68 APPROX ) TO WALK OVER THE TOP BUT CAMERA'S ARE FORBIDDEN, WE DECLINDED THE OFFER. WE CAME ACROSS THIS BAND OF ABORIGINES PLAYING THEIR DIDGERIDOO'S THE SOUND IS UNIQUE, AND THE TRIBAL DANCE TELLS A STORY OF HUNTING AND BEING FED. INSPIRED I THOUGHT I WOULD TRY MY HAND AT THE DIDGERIDOO, ITS NOT AS EASY AS YOU THINK AND SOUNDED MORE LIKE TOILET DUTIES. FRIDAY 9TH.APRIL DROVE UP THE PACIFIC HIGHWAY HEADING FURTHER NORTH, STOPPED OFF AT MACQUARIE, DID A BIT OF SUNBATHING AT BUGEWOI, THEN MOVED ONTO SWANSEA WHERE WE STOPPED THE NIGHT. SUNDAY 11TH.APRIL CALLED AT A FISHING VILLAGE CALLED GOSFORD ,THEN WE WENT TO SEAL ROCK AND TASTED SOME VERY FRESH FISH WHICH WE WERE GIVEN BY SOME LOCAL FISHERMEN AFTER LENDING THEM A CUTTING BOARD. Tuesday 13th. April on our way to NOWENDOC spectacular views sitting above any clouds which were few and far between at THUNDERBOLT WAY. Woke up to a fine sunny morning surounded by PELICANS in GLOUCISTER. 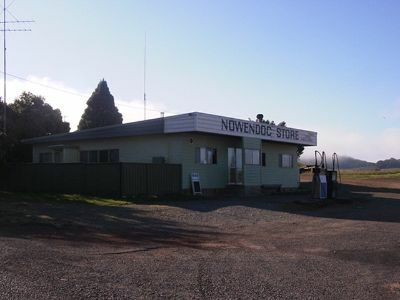 Tuesday 13th.April stopped at the top of the world here down under at a place called NOWENDOC, WHICH WAS ACCESSED UP A 1 IN 3 GRADIANT WHICH RUN FOR MILES THROUGH THUNDERBOLT WAY.This was an experience in its self, the village had superio ammenities like this village hall. WE STAYED OVER NIGHT AT SMITHS LAKE. THE SUNSETTING WAS A BEAUTIFUL SITE. 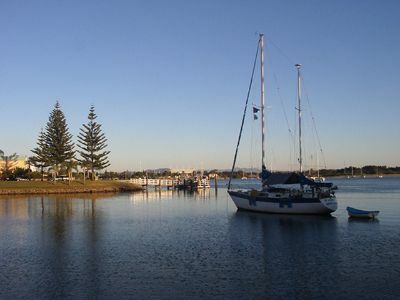 MONDAY 12TH.APRIL AFTER SPENDING MORE TIME AT SMITHS LAKE WE MOVED ONTO TUNCURRY, WHERE WE HAD A BARBAQUE THEN STOPPED THE NIGHT. The VILLAGE STALL sells most goods you would need for survival including ice lollies. With the rest of the amenities this POLICE HOUSE, in this location would cost a small fortune. Wednesday 14th. April called in at the BLACK SNAKE GOLD MINE, unfortunatly the costs were prohibited. Wednesday 14th. April called in at the BLACK SNAKE GOLD MINE, unfortunitly the costs prohibited from our fortune. Beryl's doing her best to hold this GOLDEN GUITAR but with ITS HIGHT OF 20 FOOT it would take some holding, all around TAMWERTH bands were blasting out music from funky blues to country and western Australian style. Wednesday 14th April until Sunday 18th. April stopped at TAMWERTH CAPITAL OF AUSTRALIA'S COUNTRY MUSIC. This is a view overlooking the town. MONDAY 19TH APRIL CAME ACROSS THESE CLASSIC MOTORS, WHICH WERE TOURING AUSTRALIA HAVING TRAVELLED 10,000 KM. IN THREE WEEKS, SHOWS THEY ARE NOT ALL IN ENGLAND. TUESDAY 20TH APRIL BERYL MADE NEW FRIENDS AT URALLA. CAPT THUNDERBOLT WAS A HIGHWAY MAN IN 1870 WHO NEVER ROBBED A LADY. STRUCK DOWN WITH LIGHTNING SPEED FROM SHERRIF WARTSON'S GUN AT THE AGE OF 36. ITS A GOOD JOB THERE'S DECENT REFRESHMENT ON THE WAY. WEDNESDAY 21ST. APRIL ARRIVED AT COFFS HARBOUR WITH BEAUTIFUL BEACHES AND TURQUOISE SEAS. COFFS BOTANICAL GARDEN TOOK YOU THROUGH VARIOUS COUNTRIES ON HOW THEIR GARDENS FLOURISHED. FRIDAY 23RD. APRIL A MEMBER OF THE CREW HAD A BIRTHDAY. THE LONGEST STREET IN COFFS HARBOUR WAS BERYL'S.NAMED IN HONOUR OF HER BIRTHDAY. WEDNESDAY 28TH APRIL NIGHT TIME IN NAMBUCCA EVEN A CHRISTMAS TREE. TO DARK TO SEE CAPTAIN COOK FROM HIS LOOKOUT. 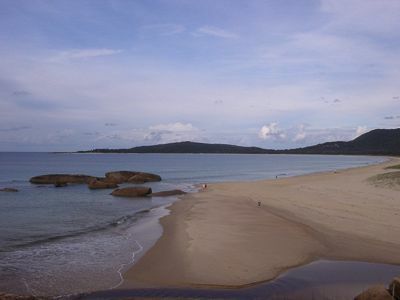 MOVED TO NAMBUCCA WITH BEAUITIFUL BEACHES. AT KEMPSEY WE FITTED A NEW INVERTER WHICH IS WORKING FINE IN THE MOTORHOME.AND KEEPING THE FRIDGE COOL. WENT FISHING AND CAUGHT A BIG EEL WHICH I THOUGHT WAS A BIG SNAKE AT FIRST.LAKE CATHIE CONTAINS PLENTY OF FODDER FOR THE DINNER TABLE. 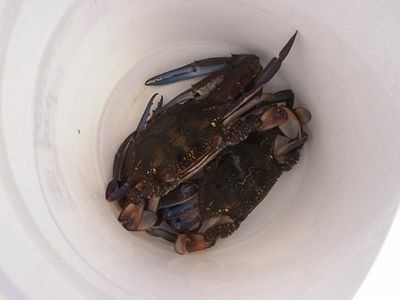 THE EEL BECAME BATE FOR THESE HUGE BLUE CRABS. THIS FISH CAUGHT BY BERYL ENDED UP ON THE DINNER PLATE. THESE FELLA'S ARE ALWAYS READY TO EAT WHAT WE DON'T.THURSDAY 6TH.MAY WE MOVED BACK DOWN TO TAMWERTH WHERE WE WILL SPEND THE WEEKEND BEFORE HEADING FOR LIGHTNING RIDGE WHERE WE WILL BE SCAVENGING FOR OPALS WITH LUCK. Friday 7th May woke up to about a dozen kangeroos around the motorhome at ASPLEY FALLS then moved through WALCHA and onto TAMWERTH. THIS LORRY AND ITS TRAILER DRAWFED OUR CAMPERHOME WHICH FELT VERY SPACIOUS UPTO THIS POINT. Saturday 8th. Maymoved on from TAMWERTH and stopped at NARRABRI where we saw some of Australia's biggest trucks not counting the tripple road trains which we have yet to see. We came across miles of cotton fields being harvested, this 20ton bail is just one of thousands. We saw the AUSTRALIAN TELESCOPE which consisted of six big dishes in line on a rail track looking all round the universe and taking pictures. Sunday 9th. May moved to LAKE YARROW did a bit of fishing before moving to WEEWAA where we stopped the night. Monday to BURRAN BORE where a 40 degree bore hole kept the swimming pool piping hot.We saw a total of 14 enmues onthe way but were to far away to get descent photo's. We moved onto WALGET and stayed the night at BARWON RIVER. Thursday 13th. May went down a opal mine and were very impressed. Saw some very interesting buildings which included a castle built by one man, a bottle shop built of bottles and a place built by using round steel cans filled with concrete.We also came across another hot bore which you could swim in. This is only a small view of the castle built entirely by one man. This bottle shop made up of bottles is on the market but will cost you around 100,000 pounds. BUT DOE'S COME COMPLEAT WITH ITS OWN BOTTLE DOG KENNEL. The concrete gone into this habitat building will keep LAFARGE going for many years. This is LIGHTENING RIDGES own hot sulphur bath which cures many aching bones but does make you tired if you spend to long in the sulphur heated water,which is fed via borehole from a 2million old artisian underground lake. WE DECIDED TO EXPLORE THE SCRUB SO WE FOLLOWERED THE SIGHN'S. HAVING COME ACROSS A SETTLEMENT WE DECIDED TO INVESTIGATE FURTHER. THEY HAD ALL MOD CON'S LIKE THIS FILLING STATION. A PUBLIC TOILET THAT LETS THE PUBLIC SEE INTO. EVEN ITS OWN POST OFFICE, NOT TO SURE HOW OFTEN THE POST IS COLLECTED. AND OF CAUSE ITS OWN CHURCH, A BIT DESERTED WHEN WE WENT TO VISIT. WE CAME ACROSS THE PUB IN THE SCRUB AN EXPIERIANCE. THE INSIDE OF THE CLUB WAS QUITE PLEASENT, AND HAD ITS OWN STAGE FOR ENTERTAINMENT. IT EVEN HAD ITS OWN 18 HOLE GOLF COURSE, WHICH THE GREENS WERE MADE OF A MIXTURE OF SUMP OIL AND SAND TO STOP THE COUSE BLOWING AWAY.THERE WERE A FEW OBSTICLES LIKE TREES AND A NUMBER OF KANGEROOS. THERE WERE QUITE A NUMBER OF OPAL MINE WORKINGS ON THE WAY BUT THIS IS THE FIRST OPEN CAST MINE WE HAD COME ACROSS. FINEALY IT WAS GETTING DARK SO WE DECIDED TO RETURN TO OUR BASE CAMP ON THE OUTSKIRTS OF LIGHTENING RIDGE,READY FOR MORE ADVENTURES. A MATE I MET IN LIGHTNING RIDGE SHOWING HOW TO MINE FOR OPAL. A BUCKET ON A HOILST IS FILLED WITH THE MATERIAL THAT IS JIGERPICKED. IT IS THEN WHINCHED UP THE LADDER BY ELECTRIC MOTOR. THE LOADED BUCKET IS BOUGHT TO THE SURFACE AND TIPPED INTO A PARKED WAGON. A LOT OF THE WAGONS ARE THE CAST OFFS FROM A BYGONE AGE. 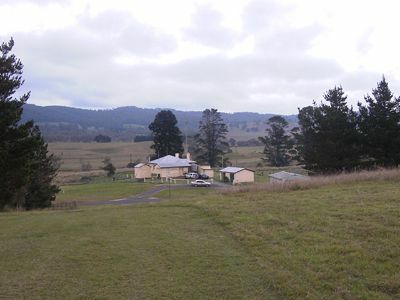 THERE ARE PLACES AROUND THE RIDGE WHERE OPAL CAN BE BOUGHT AND SOLD. THREE VERY GOOD FRIENDS WHERE WE STAYED DURING OUR VISIT TO LIGHTNING RIDGE. AFTER A HARD DAYS GRAFT ITS GOOD TO RELAX AROUND THE FIRE. WE SHALL STOP IN LIGHTENING RIDGE THROUGH THE WEEKEND MOVING ON MONDAY 24TH. MAY UNLESS WE STRIKE IT RICH WITH THE FAMOUS BLACK OPAL. MOVED ONTO COLLARENEBRI WHERE WE PASSED MORE EMU'S THEN WE STOPPED THE NIGHT AT MOREE. WE STOPPED AT CRANKY ROCK WARIALDA FOR A COUPLE OF NIGHTS WHERE WE SAW KANGEROO'S POSSUMS AND THIS FELLA BELOW. HE WAS VERY INTERESTED IN EATING THE CAMERA. THERE WERE MANY INTERESTING GRANIT ROCK FORMATIONS. WHICH FORMED MANY INTERESTING REFLECTIONS IN THE WATER BELOW. Wednesday 26th. May we moved through INVERELL after a short stop, then onto GLEN INNES we are now in CELTIC COUNTRY and is home to the BLUE SAPHIRE we will try our luck again. QUEENSLAND GO TO MAIN FRONT PAGE AND CLICK ONTO QUEENSLAND AND FOLLOW OUR JOURNEY.